When it comes to fake tanning, there is a lot that I have learnt over the last couple of years. I know how to prep my skin before I apply fake tan, I know which tans are quick and easy and I know how to make sure I don’t turn up green (yes, that has happened before)! Today I thought I would show off my top 4 favourite tanners to help those of you out there who are struggling to find that perfect glow. I know that something like this would definitely have helped me when I was going through that tough stage of awkward tanning! Up first is a brand that I have loved for quite some time now and a brand that are totally affordable for those of you new to tanning / tan constantly. Sunkissed actually have two spots in my top 4 because I love them so much! My number 1 is the Sunkissed Rapid Tan, a tanning mousse that develops a gorgeous natural glow in just 60 minutes. It’s one of my all-time favourites and one that I go back to every time. For just less than £3 and available in none other than Primark, it’s so easy to get hold of and such an amazing tan. It’s one that I definitely recommend if you are just starting out with fake tanning at home; it’s streak free, and has colour as you apply so that you know exactly where it’s going to be tanning! My other tan fave from Sunkissed is their new 60 minute Moisturiser Spray Tan. Perfect for applying at home, just spray on some product and massage in with a mitt for all over coverage that develops in just an hour! Sadly, it’s not pigmented when first applied like the Mousse tan, but as long as you ensure you don’t go too crazy, it’s absolutely perfect for a bronzed look. 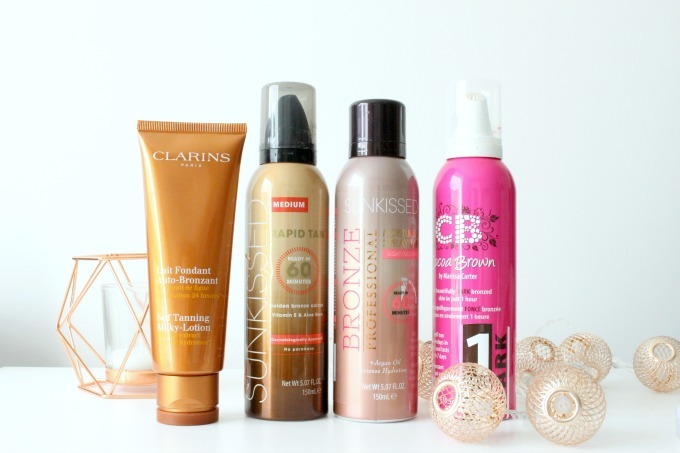 Sunkissed are an amazing self-tanning brand and they are right up there as some of my favourite tans. Another favourite of mine, for a slightly darker tan is the Cocoa Brown Dark 1 Hour tan. You may have seen on my social media or in past blog posts how much I love Cocoa Brown and trying the dark tan just made everything that much better. With Cocoa Brown 1 hour tan I usually left it on for 2-3 hours for the tanned look that I loved and with the Dark tan I only have to leave it on for an hour to see the results that I so desperately want from a fake tan. Cocoa Brown is a brand that I am a little obsessed with and as they have so many great products I’m sure you’ll see them a little more on my blog in the future. The Dark tan is streak free, dries within seconds and is really well priced for such an amazing tan. It’s one that I re-purchase time and time again along with the others in this post and one that I couldn’t not have around for emergencies. I also love the Cocoa Brown Golden Goddess Dry Shimmer Oil, but you’ll have to keep your eyes peeled for another post for that review as I couldn’t help but give it it’s own spotlight! Last up is the Clarins Self Tanning Milky Lotion, an easy moisturising tan that gradually sinks into the skin and develops throughout the day. Again, with this one you do have to be careful with not over-spreading the love when applying, but done properly this tan slowly produces a lovely natural tan. I love using this on my face as it’s specifically designed to give moisture and not dry out the skin and it leaves my skin not only looking healthy but feeling healthy too. At £20 this is a much higher priced product than the other three in this favourites post, but trust me when I say that this product is 100% worth it. I wouldn’t promote a product if I didn’t truly believe in it and with a product that little bit more pricey, I definitely put it through it’s paces before recommending it. This is the perfect tanner to match with any of the others I’ve mentioned to give your face a healthy glow and not damage it. I often find myself applying this lightly every couple of days to just give it a little re-boost after continuing with my daily skincare routines. What are your thoughts on my favourite tans? Do you like any that I’ve mentioned or will you be trying them out for yourself? Let me know in the comments!